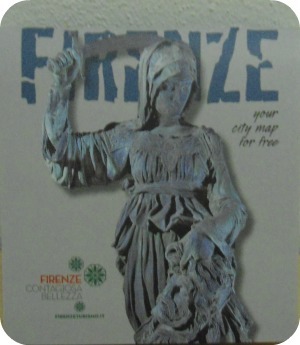 You can get a free map of Florence Italy in several places in town. 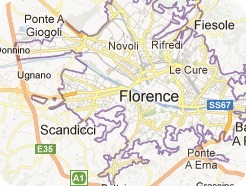 But, if you want to familiarize yourself with the city right away, print out this free map of Florence. Once you get here however, I recommend going to one of the tourist information offices that give out very good maps and lots of other goodies too. The biggest information office is located right near the train station in Piazza Stazione, 4. To find it, look for the big roundabout with flowerbeds in the middle - it’s a busy intersection near the front of the station. A free map covering all of the main downtown area in detail with a street index. This map is all you need for finding all the main museums, monuments and sights in the center of town. Note: you have to ask for this map at the desk, they'll tear it off a pad so when you get it, it's not folded but is the size of a place mat. There's also a free map that covers a much more extended area with a handy street index. This is perfect if you’d like to explore some outer areas of town. These office have lots of other tourist information about the city that will come in handy. 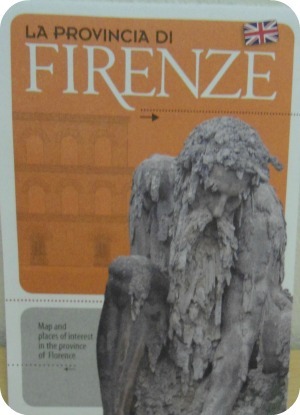 The thing is, these convenient flyers and leaflets with the names, addresses, opening hours and descriptions of museums, churches, parks and monuments are not usually kept on display. You have to ask at the desk – lots of visitors just go in and only take the pamphlets they see (advertisements for tours, services, etc) because they don’t know about the goodies that are behind the counter. Tip: print out this page and take it with you, then you just have to show it to the person at the desk to get all these useful free resources! 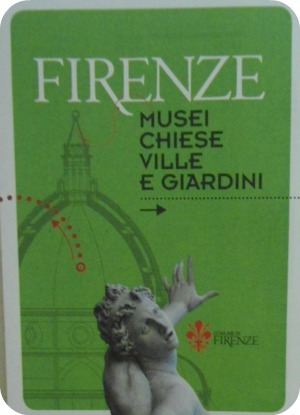 A leaflet about museums, churches, villas and gardens (left below). 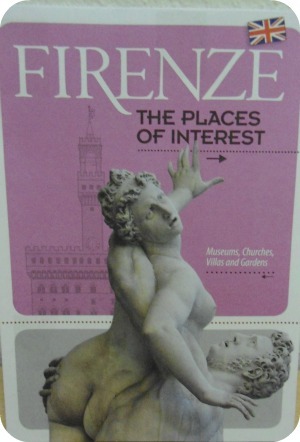 A pamphlet summing up all the places of interest in town (right below). There's also a booklet with a map of the city province areas that talks about places of interest just outside of town. 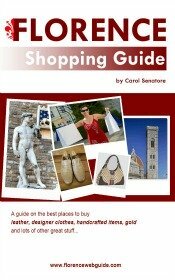 If you’re planning on taking some day trips from Florence to nearby villages this pamphlet is very handy. If you find the main office near the station is too crowded, there's another one near the Duomo cathedral in via Cavour 1r. Standing facing the cathedral, it’s the wide pedestrian street on your left. You can also pick up a very useful bus map at the Ataf customer service office (sometimes the tourist offices have this map too). 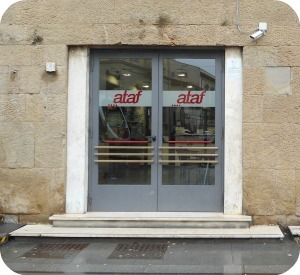 There are two Ataf offices at the station. One is at the front of the station in via Piazza Stazione, at the top of the bus-taxi ramp under the station clock. The second is on the tram side of the station in via Alamanni. Go down the steps leaving the station, turn right, go past a Conad supermarket, a florist and a post office. The Ataf office is next.